2 weeks after last spring frost, as coleus resents cool soil. Coleus are often grown in containers that can be grouped with other shade lovers such as Begonia and Fuchsia to create instant gardens on the terrace. If planting in beds, make sure the soil is fertile and very well-drained. Many new coleus thrive in full sun, but if the leaves bleach try moving pots to afternoon shade. Coleus roots readily and can be re-planted slightly deeper than its previous depth in very well-drained soils, which will encourage fresh growth of roots as well as stems. Pinch back when planting to encourage a more bushy form and increase your supply, as coleus cuttings root easily in water. Watering Details: Water about twice a week (about an inch each time), more during particularly dry spells, as coleus prefers to be kept evenly moist, but never soggy. Containerized plants may need more. Soil pH: Tolerates most soil pH levels. Fertilizer: Mix a time-released fertilizer into growing media or ground prior to planting. A regular application of water-soluble fertilizer is beneficial. Diseases & Pests: Aphids and whiteflies may appear—prevent or treat by hosing plants down regularly, or misting daily if they are indoors. 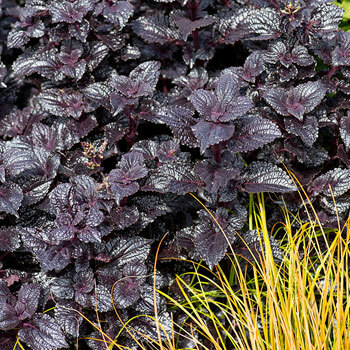 Plant: Nearly black foliage is shiny in appearance, appearing on dark purple-maroon, upright stems. Flowering: Small flower spikes in various heights with tiny white to lavender flowers may appear later in the season. Pinch them off to encourage more lush foliage. Seeds: Tiny flowers will turn into brown nutlets and may or may not contain small brown seeds, but plants grown from these seeds may not come true. This plant is a member of the Lamiaceae family, also referred to as the mint family, of which there are over 230 genera.